Note: The following article was published in the Courier-Journal in advanced of the celebration on Friday, September 18, 2015. Photos courtesy of Lora Haynes. Months before anti-Muslim graffiti defaced the walls of the Louisville Islamic Center, the mosque community had been selected to be honored for compassion. A 4-foot-long, sandalwood “compassion bench” will be dedicated outside the mosque Friday, meant as a symbol of the acts of kindness and interfaith outreach efforts performed by the center community. 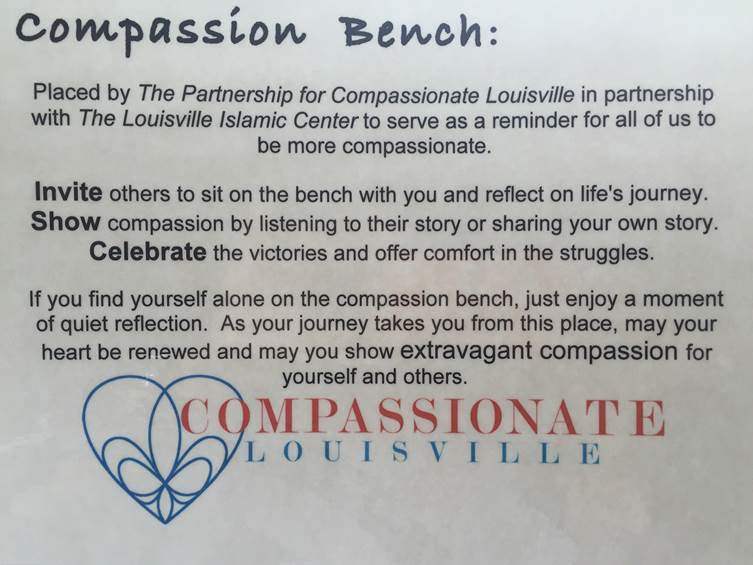 Compassionate Louisville, the volunteer organization committed to making compassion a concrete part of daily life, decided earlier this year to honor the mosque with the city’s first compassion bench. Martin Brooks, who works to connect Muslim and Christian adherents through the organization Peace Catalyst International, suggested the center as a good fit for the bench. “It’s a place where I can sit with somebody or my Muslim friends can sit with their friends and share their journey,” Brooks added. There are people at the center doing good work that community members might not know about, he said. Mosque members were among the first to respond to Henryville, Ind., after it was devastated in 2012 by a tornado. 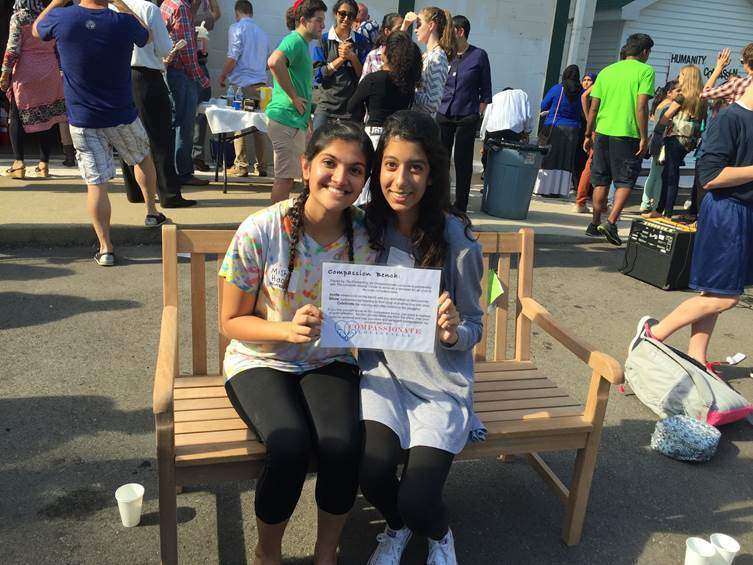 The center hosts interfaith dinners uniting Jews, Christians and Muslims. Just last week, he said, the mosque bought lunch for hundreds of first responders after the city’s 9/11 memorial downtown. The bench dedication, originally meant to be a small affair, has taken on new meaning in light of Wednesday’s vandalism. Mayor Greg Fischer called on the community to join at the mosque Friday at 3 p.m. to paint over the spray paint vandalism and see the dedication. The bench can spur conversations that help connect those who might not otherwise connect, said Lora Haynes, an associate professor at the University of Louisville who volunteers with Compassionate Louisville and the yearly Compassion Games. Dozens attended a Thursday morning news conference denouncing the vandalism, which is under investigation by multiple law enforcement agencies, including the FBI. “Please pardon me if I’m emotional, but this overwhelming support is really humbling to us,” said Dr. Muhammad Babar, a center member who spoke at the event. Reginald Glass, chair of the city’s Human Relations Commission, characterized the crime as an act of terrorism. Friday’s gathering at 4007 River Road, Brooks said, is meant in part to facilitate greater understanding and tolerance with open dialogue. “We have to get past the stereotypes and the labels and talk to the person across the table for us,” he said.